Onyx hasn't said much about their upcoming 8" ebook reader since first quietly announcing it this spring, so when these several photos crossed my desk today I had to share. Onyx showed off the i86 and other ereaders at the Hong Kong Electronics Fair earlier this month, and zol.com.cn got a few photos. To be honest, I don't have much to show you and tell you other than the 3 photos, but I found them interesting and I bet I am not the only one who feels that way. Zol didn't offer much in the way of detail, but the photos tell us that the i86 now sports a pair of page turn buttons to the left of the 8" screen. In comparison to the original product image, it has a decidedly lopsided appearance (which may or may not be a good thing). According to the original specs, the i86 runs Android 4.0 on a 1GHZ CPU with 512MB RAM. It has Wifi, Bluetooth, 4GB internal storage, and a microSD card slot. The spec list also mentioned text to speech, suggesting that the i86 also has at least a headphone jack. The 8" Pearl E-ink display has a resolution of 1,600 x 1,200. That gives it a sharpness of about 250 ppi. That's not a sharp as the 6.8" screen on the Aura H2O or the T68 Lynx, much less the super high resolution screen of the Kindle Voyage, but what the i86 lacks in sharpness it makes up for in size. When it comes to larger ereader, the screen on the i86 is the sharpest available. And on top of the high resolution screen you'll find a frontlight and an IR touchscreen from Neonode. In terms of ebook compatibility, the i86 supports a broad range of formats, including ebook formats like (DRMed) PDF, (DRMed) Epub, and FB2 in addition to document formats like Doc, CHM, html, and RTF. There's also support for MP3 playback. This device is running the same reading app as on Onyx's other Android-based ebook readers (with the same note-taking and scribbling abilities). Onyx hasn't said when we might see the i86 on the market, and since we have so little information it is too early to speculate. Instead I will be keeping an eye on Mobileread Forums; Onyx sometimes posts product announcements there. There must be a problem with those 8″ hd screens: it can’t be a coincidence that both this device and the Pocketbook Inkpad have the same ugly lopsided design, with one bezel so much wider than the others (on the left on the i86, on the right on the Inkpad). I mean, there are more discreet and symmetric ways of integrating physical controls, so that can’t be the reason. There must be another, bigger issue with the electronics in those devices that require a wider bezel. It’s too bad. I’ve been waiting for a high-res 8″ reader but in both cases the asymmetry would drive me absolutely crazy while reading. I’m going to have to pass. Do you know the weird part? This 8″ screen was already used in a color E-ink screen unit. The only difference between this screen and the 8″ Triton screen is that this one doesn’t have that color filter stuck on top. And yet they’re having trouble making the screen. Strange. I’ve written this elsewhere, but I don’t think this is really an issue with the screen. I think the pics here are of a rough prototype, not a product — it’s not just the asymetrical placing of the screen, it’s the huge bezel which there wouldn’t be any reason for on a touchscreen device. No way this would be a final device. An e-reader is not rocket science, and nothing about the CPU/memory subsystem, battery, case or display needs to be cutting edge. Same goes for software. There have been virtually no new features in them since the original Kindle popularized the category. I think there simply isn’t a decent market for “large” readers, so the few vendors in the space are dragging their feet about committing to it (and Onyx isn’t even one of them — the i86 has never been mentioned by them on their websites; in fact, the only mention by them was on a facebook posting in March). The 2 models that were actually sold (Icarus 8 & Pyrus Max) were discontinued after months. It’s very telling that Amazon, who certainly can commit resources to product development, chose not to offer a larger-screen version of the Voyager, and indeed, their only large e-reader, the DX, is a kludgy, 2011 minimal refresh of a 2009 device. I recently gave up on waiting for a 8″ e-reader device and bought a 8″ LCD Android tablet with 4:3 aspect ratio screen from one of cheaper but still name-brand vendors (Acer). At $130, it works very well as a dedicated e-reader for many hours a day, half the anticipated price of the 8″ e-ink-type e-readers. There’s also the Pocketbook Color Lux. That had an 8″ E-ink screen. I can’t understand why you would refer to color lux. That had a much less sharp display (800*600, 125dpi), so more comparable to onyx universe, and most importantly it doesn’t have Android. I’m looking for an e-ink reader that I can relatively comfortably read magazines with (in addition to books). An 8″ reader with android 4.04 or newer would be ideal. 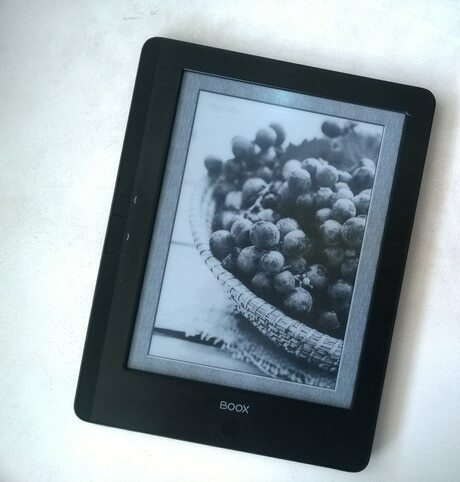 And no, I won’t buy a tablet because I read a lot and the most important thing for me is the e-ink screen. The color Lux had the same 8″ screen as on the new Boox i86, only the Color Lux had a color filter on top which reduced the resolution. The thing is, a color E-ink screen requires 4 times as B&W pixels to make up a color pixel (RGBW). That reduces the 1,600 x 1,200 to 800 x 600.